Dr Naidoo has over 14 years experience in clinical and medical administration roles across both the public and private sector, including as Director of Medical Services of The Wesley and St Andrew’s Hospitals in Brisbane and the first Deputy Director Medical Services at the newly established Lady Cilento Children’s Hospital. She holds a Masters in Health Management and fellowships with the Royal Australasian College of Medical Administrators and Australasian College of Health Service Management. 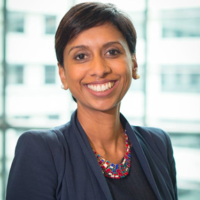 A firm believer in the benefits of inclusion and diversity in leadership and decision-making, Dr Naidoo is the recipient of a Joint government/Australian institute of Company Directors Board Scholarship and has recently undertaken the prestigious Harvard Executive Women in Health Care program in Boston. She is a not-for-profit board director and serves on the Queensland Medical Women’s Society as the Australian Federation of Medical Women Representative. She is an advocate for inclusive leadership, doctor health and wellbeing and flexible training. With a strong interest in standards of care, education and training, diversity and medical professionalism, Dr Naidoo is passionate about healthcare improvement and person-centred care. She is mother to two aspiring medical administrators aged 6 and 7.